I was beginning to wonder if I had made a mistake, spending the evening glassing a field instead of hunkered down in a pit blind overlooking a waterhole deep in the Alberta bush. However, when Harvey’s guide had come in the evening before, all excited at having glassed two 150-class bucks in the alfalfa field, I figured scouting there would be a better bet. Scouting is rarely time wasted. Hunting with bow and arrow requires precise stand location. After I spent the morning in a lofty perch watching does and small bucks amble by, Harvey drove me to the alfalfa field so I could scope it out. According to the guide, a dozen does and the two bucks had come out of the far corner of the field just before dark. Does and fawns started filtering out of the thick bush in the corner cul-de-sac an hour before dark. Finally, the two big boys eased out of the brush and spent five minutes warily eying the open field before feeding slowly along a brushy edge. By the time they moved into the open, it was fully dark. The following day, after another futile morning hunt, a hearty Canadian breakfast, and a cat nap, Harv and I drove back to the field at midday and spent a couple of hours digging a pit blind back in the brush along the route the bucks had taken the previous evening. Deer could emerge from dense bush anywhere along that quarter-mile field, but every deer the guide and I had seen had moved out of the back corner and fed close to the edge until almost dark before moving out into the alfalfa. While hunting that evening, I was drenched by a cloudburst, watched a doe come within a few steps of blowing my ambush, and arrowed a 150-class 10-pointer at 30 yards. The buck came out of the corner with his equally large companion and followed the same route as the previous evening. This only reinforced my conviction that scouting during the season and hunting field corners are both very good ideas. It took a couple years on one of our Iowa leases to finally get me locked onto this thinking. The first couple of years we held the lease, I considered a corner in the upper end of a harvested cornfield as a potential stand location. I glassed the field from a knoll at the lower end, where I had a good view up the valley. I observed countless deer crossing from the timber on one side of the field to the other, often pausing to feed out in the field. There was a lower corner, too, but it was less than 200 yards from a dirt road and visible from several places along that road. I talked myself into believing that a trophy buck wouldn’t use that corner until after dark, as even light traffic (minimal at best) made it a nocturnal-only crossing. Then, the third year I had the lease, the farmer planted soybeans in the field, and when he harvested with a larger combine, he discovered it wouldn’t get into the tight confines of this near corner. So, he left a couple of small patches of unharvested beans. 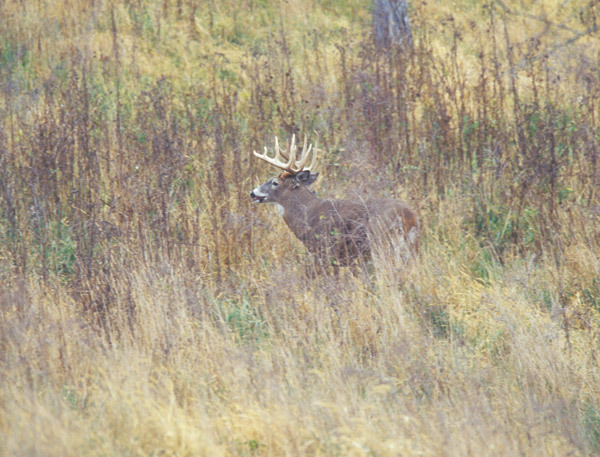 While glassing the field, he’d watched a monstrous buck feeding in the small bean patch. Rudy, a knowledgeable whitetail judge, guessed the buck, which sported at lease a dozen points and a 10-inch drop tine, would score in the high 180s. The next evening, Mike Kraetsch, my son-in-law, glassed the same buck in the same corner. Road or no road, the following evening I had a hunter in position, downwind and waiting for a chance at the big buck. Frigid weather and bare ground brought the deer out early to scarf up the remaining beans. Several does, their fawns and a couple of smaller bucks were busily feeding in the corner, gradually moving out into the field, when the big boy finally stepped out. He took his time moving along the edge, hanging close to escape cover, all the while approaching my hyped but disciplined hunter, who had set a limit of 125 yards for his 12-gauge slug gun. The big buck was still out of that range when another buck, a mature 10-point, appeared on a grassy slope just above the hunter and paused to observe the bigger deer down in the corner. A firm believer that a deer in range is better than one out of range, the hunter took the standing broadside shot. The buck run across the field and then piled up about where the even bigger buck had been standing. This 154-inch buck had actually crossed the road coming to the corner. So much for the road impeding daytime deer traffic. The following year, we took a 164 buck from that stand. The next year, a 130 buck fell on a morning hunt, and a monster 184 fell later that afternoon. Not bad for a corner I had spent two years overlooking, thinking it wouldn’t be worth hunting. It’s easy to pick out likely corners in a hunting area by studying the free aerial maps online at www.googleearth.com. With a year’s subscription, you can go to www.mytopo.com and download as many U.S.G.S maps and aerial photos as you want. Pick out likely corners, and then go in on foot to check it out. Deer, especially mature bucks, like to stick close to cover and feel more secure in field corners or cul-de-sacs with nearby escape routes. They hang back until almost dark before moving out into the field. Some corners are especially attractive, for reasons known only to the deer, and the same attraction pulls them there in the mornings, when they are finishing up their feeding. As it gets light, they start filtering toward the corner, even though they may be passing dense brush along the way. Eventually, they exit the field at the corner. In the evening, the opposite occurs. The deer move out at the corner and then meander down the edge. As an outfitter, I rely on food plots to get my clients on nice deer, and I often locate a plot to take advantage of the whitetail’s affinity for these corners. Plots located in small corners and cul-de-sacs surrounded by dense timber are immensely more effective. I planted one plot that measured 600 yards by 22 yards (food plots on property enrolled in the Conservation Reserve Program are limited to 22 yards width, but there is no limit on length). The plot was out 30 yards from heavy timber with open CRP on the other side. Both ends of the plot purposely ended at field corners. I spent hundreds of hours glassing that field, and on a number of occasions, I counted more than 100 deer in the food plot and the CRP. I would guess that 80 percent of those deer entered through one of the two corners. Far more deer moved through the south corner, because of the way the surrounding timber laid out. An aerial view of the property and surrounding area clearly showed why the deer preferred this travel route, coming and going from surrounding cropland. Two years ago, the owner took the field out of the CRP. This year, the whole 521 acres was planted in corn. Yet deer continue to use those corners as readily as when I had a food plot there. I have taken several Pope & Young bucks out of a 20-foot ladder stand in the south corner. 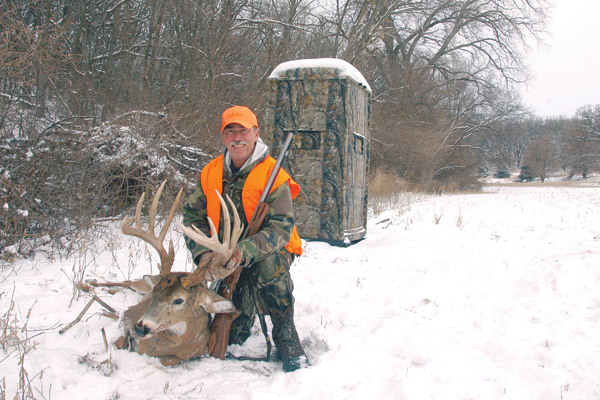 This past fall, a client in a ground blind took a monstrous 198 buck that first appeared in the far corner and then moved down the field to within muzzleloader range. Several years ago, I hunted a large farm just off the Missouri River that included timbered ridges and slopes with open meadows and food plots on top. The owner only allowed buck hunting with bows. But during gun season, he did allow friends to rifle hunt for does, to thin the overpopulation a bit. Because I was advising him on management issues, he agreed to let me hunt bucks with a muzzleloader. I spent five fruitless days in the food plots, ridgetop crossings and open fields without seeing a shootable buck. The big bucks were super wary after being bowhunted, and the fact that there were gun hunters on the property only made them more cautious and nocturnal. I finally took the time to really study an aerial photo of the property and located a small open field bordered by a timbered slope above a dry creek bed. The other side was a dense thicket of cedar. The owner said no one ever hunted there because it was such a small area. Perfect. It was hot and dry the following early afternoon as I set up in the shade of a brush clump on the downwind side, 100 yards out from the corner. I propped my .50 muzzleloader on shooting sticks, ready for action. At 4 o’clock, I caught movement in the cedars and had barely gotten my paperback book tucked under my leg when a doe stepped out at the corner, scanned the opening briefly, and then bounded across and into the timber on the other side. Needless to say, I was primed and pointed when the 10-pointer stepped out behind her. This coming season, I plan to hunt whitetails in three states, providing I can draw the nonresident licenses. And you can bet that long before any hunt, I will be studying aerial photos and maps, looking for corners to check out when I get on the ground. I believe there’s no better way to increase your chances of taking a trophy buck than by getting it cornered.